Manilla Paragliding imports and stocks the main text books used by paraglider pilots. Also the Jocky Sanderson double DVD Security in Flight and Speed to Fly (XC), Performance Flying DVD and other event DVD's are in stock. The worlds best paragliding and hang gliding cross country routes in one hard cover coffee table quality book. Excellent high quality production from XC mag with full stories and site info for 20 classic routes on 5 continents. A must have for all XC pilots ! Includes the Manilla > Bingara Classic XC route. For those with a keen eye you may have noticed the front cover is ours as well !! The only general text book to get for beginner to intermediate pilots. Well researched, well written, great images and diagrams. The best weather text book for sports aviation. Now in its 4th edition there is nothing more than can be written on the subject - Pagan has covered all the important points. This is the best text book on thermal flying there is. The just released 2nd Edition has an extra 36 pages of information. Martens is an expert XC pilot based in Germany but has flown all around the world. Great images and diagrams make understanding thermals and XC easy. 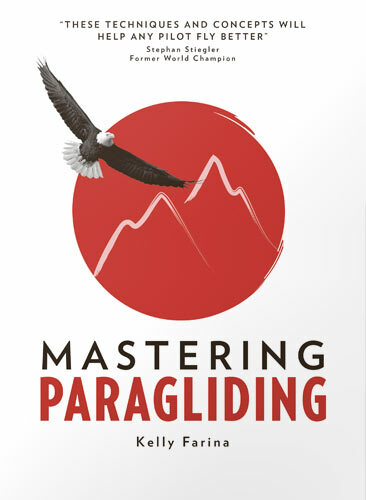 Kelly Farina is a expert paragliding coach and has written a great book for mastering Cross Country Flying. It's full of tips and tricks presented in a methodical way that beginners and experienced pilots will gain knowledge from. Fifty Ways to Fly Better is essential for all pilots who want to reach their potential. It is packed with the latest techniques and thinking from Bruce Goldsmith and some of the world’s best pilots and instructors. The book draws on 20 years’ worth of Icaristics, Bruce’s well-regarded column in Cross Country magazine, and combines it with lots of completely new material – all revised and updated for today’s pilots. DVD's - all DVD's are one postage charge ($6) for as many are ordered. Jocky Sanderson is an expert in SIV and his Security in Flight DVD covers all the main SIV manoeuvres. Speed to Fly is a XC teaching DVD with loads of tips and tricks from experts. Some of the film was shot in Manilla ! Jocky Sanderson's excellent new DVD covering XC, SIV and ACRO. A definate must have for the collection of any serious pilot especially those moving up from a Beginner > Intermediate glider. The professionally filmed and edited documentry of the 10th FAI Paragliding World Championships - Manilla 2007. Each task is followed closely with brilliant in air footage, digital track log simulations and interviews. Great original sound track from Australian bands. A classic doco, professionaly filmed and edited following the first ever FAI Cat2 Open Distance event. Racey sound track and editing, and with tips and tricks interviews from some of the top pilots. Email : Click here !